The next quadrennial of figure skating begins with a young pair team pushing limits. Yes, a raft of top Canadian pair teams has left the scene, but Evelyn Walsh and Trennt Michaud will be carried forward by what the others have left behind. It’s all very highly motivating. Walsh and Michaud will compete at their very first senior Grand Prix this year, at Skate Canada International in Laval, Que. In October. And they know it’s time to leave their comfort zone. 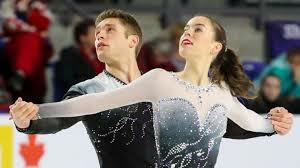 Walsh, 17, and Michaud, 22, have been together only two years and before that, Walsh had never skated pairs. Her learning curve has been steep, but together the two won the national junior title the first year they were together. Internationally, they skated at Junior Grand Prix last season, but nationally, they went senior, finishing fifth. And they see a yawning gap in front of them after the retirement of world pair champions and Olympic bronze medalists Meagan Duhamel and Eric Radford, and national medalists Lubov Ilyushechkina and Dylan Moscovitch. And then the surprise: the splitting of a promising pair Julianne Seguin and Charlie Bilodeau before the season really started. Yes, there is room, lots of it. But Walsh and Michaud want to step into the space with some good material. They’ve been working on lots of different triple jumps (toe loops, Salchows, loops and the odd time a flip) over the summer, and throws, too. They are working on a throw triple Lutz and a couple of new difficult lifts, born out of being senior and having to navigate new ISU rules. And guess what? They’ve been going to dance coach Paul MacIntosh once a week or every two weeks on basic stroking, eventually footwork, and then hopefully, transitions, too. A touch of dance. After a successful career in junior, the group had a chat, and “ we want to take the next step so we tried new things,” Michaud said. So who inspired them in dance? Silly question. Tessa Virtue and Scott Moir, of course. They watched their “Moulin Rouge” with fascination – Michaud had skated a brilliant program to “Moulin Rouge” music several years ago with another partner. It’s one of his favourites. “Whenever you can tell a story like that in four minutes, it’s something to learn from,” Walsh said. “It’s absolutely incredible,” Michaud said. “Even just watching it on Stars On Ice this year, they performed it again. And it was the exact same. They have this thing like we are trying to pull out of ourselves in practice. Now that’s our main focus, practicing like Tessa and Scott do. So that brings us to Walsh and Michaud’s music choice for the short program this season. You wouldn’t know it, but it’s Beatles music. It’s “Come Together” but it’s performed by Gary Clark Jr., from the Justice League movie soundtrack. As Purkiss says, this is a “kicked-up” version. This was outside of their comfort zone. The music swallows them up in the arena. They hope the audience feels what they are feeling. They had thought about skating to Romeo and Juliet last season – the original classical version – but “then we weren’t feeling it so we put it on the backburner for later on,” Michaud said. They’ve come back to it this year while using music from the more recent movie, which has a more contemporary feel. Their goals this year? To experience the differences of their two programs to the fullest. “There is no pressure this season on us,” Walsh said. “This is just our first year in senior on the Grand Prix circuit and we’re trying to have fun, sell those elements and connect, experience different types of patterns and programs.